This book covers almost all the concepts of Python in an easy and simple language. The reader starts at the basic level and goes up to the higher levels as he/she gains knowledge of the concepts. 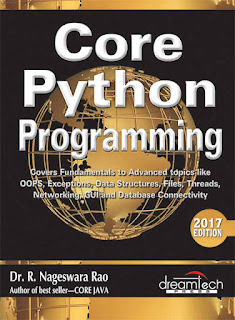 The book first explains the basic concepts of Python such as datatypes, variables, loops, etc. and then discusses arrays, strings, functions lists, tuples, dictionaries, stacks, linked lists, queues, etc. This book explains each and every concept with the help of a running program and also describes the logic behind the program. As this book contains hundreds of programs, it can be used by students to solve programs generally asked in their theory and lab examinations as part of their courses like BCA, MCA, BE, and B.